WE THINK of an abyss as an immeasurable depth. We use the word frequently in a figurative sense, of good as well as of evil. Thus we speak of an abyss of love, of goodness, but also of an abyss of malice, of vice. The goodness or malice in either case is so great that we cannot fathom it. In calling the Sacred Heart of Jesus an abyss of all virtues we wish to say that He possesses all virtues in such perfection that we cannot grasp their grandeur nor sound their depth. There is no virtue, no matter how difficult to practice and how rare among men, that is not found in Him, none that is not present in Him in all its possible perfection, without flaw or deficiency. Christian perfection calls for the presence of all virtues. However, it is possible that the one or other virtue may be weak and deficient, or that, because of such deficiency, virtue coexists with faults and even sin. A man may be pious but at the same time proud and domineering, charitable but also impatient and intolerant, temperate but still narrow and greedy, just while he is harsh and unforgiving. Even among the Saints, we find heroic sanctity along with human faults and shortcomings. Virtues may also be present in various degrees of perfection. Frequently Saints distinguish themselves in the practice of one particular virtue. Thus, St. Paul was distinguished by indomitable zeal in his missionary labors, St. Francis of Assisi by love of poverty, St. Francis de Sales by meekness, St. Aloysius by contempt of the world, St. Theresa of the Child Jesus by childlike simplicity. But all Saints could have been more perfect even in the virtue in which they excelled, and one Saint may be more perfect than another. Our blessed Mother certainly possessed all virtues in a higher degree than all Saints put together. In Jesus we behold a wonderful harmonious blending of all virtues. His virtues are without flaw or deficiency, in a degree of perfection that cannot be increased, because in Him virtue shares in the unfathomable depth and infinity of the Godhead. In Him there is love without selfishness, obedience without servility, patience without weakness, firmness without pride, courage without recklessness, authority without haughtiness. Absorbed in the presence of God Whom He beholds face to face, He is yet most active in behalf of men, whether it be in the carpenter shop at Nazareth doing manual work, or following the highways and byways of Palestine in quest of the lost sheep, preaching to the multitudes, healing their sick, driving out devils, consoling the sorrowing. Obedient unto death and respecting authority, He is fearless in denouncing vice. Though full of kindness and mercy toward the sinner, He is unyielding toward sin. Having healed the man who had been sick for 38 years He dismisses him with the warning, "Behold, thou art cured; sin no more, lest something worse befall thee" (Jn. 5: 14). Harmony of love and firmness shines forth in the relation of Jesus to His Apostles. He had chosen them to be the pillars of His Church and He loved them. Yet even in their regard He insists upon His unchangeable rights as God-Man. It was at the Last Supper, when Jesus had instituted the blessed Eucharist and celebrated the first holy Mass, had made the Apostles the first priests and bishops of the New Testament and had given Himself to them in Holy Communion, that He addressed to them the awe-inspiring words, "You are My friends, if you do the things I command you. . . . You have not chosen Me, but I have chosen you" (Jn. 15:15 f.). Notwithstanding their election and the privileges bestowed upon them, His friendship with them comes to an end the moment they refuse to do what He commands. This is the most perfect harmony of virtues, governed by the unchanging principles of justice and love. Thus above all the Saints, Mary the Queen of all Angels and Saints not excepted, stands Jesus in the unapproachable majesty and holiness of His Sacred Heart. Compared to His holiness the virtues of all Saints disappear. Just as the beauty of the starry sky becomes invisible at the rising of the sun, so does the holiness of the Saints disappear in the presence of the Divine Sun of justice. And just as the light of the moon is but the reflection of the light of the sun, so are the virtues of the Saints nothing but a faint reflection of the virtues of the Sacred Heart of Jesus. Whatever virtue and holiness is found in them has its origin in but is infinitely surpassed by the holiness of the Sacred Heart of Jesus, the abyss of all virtues. 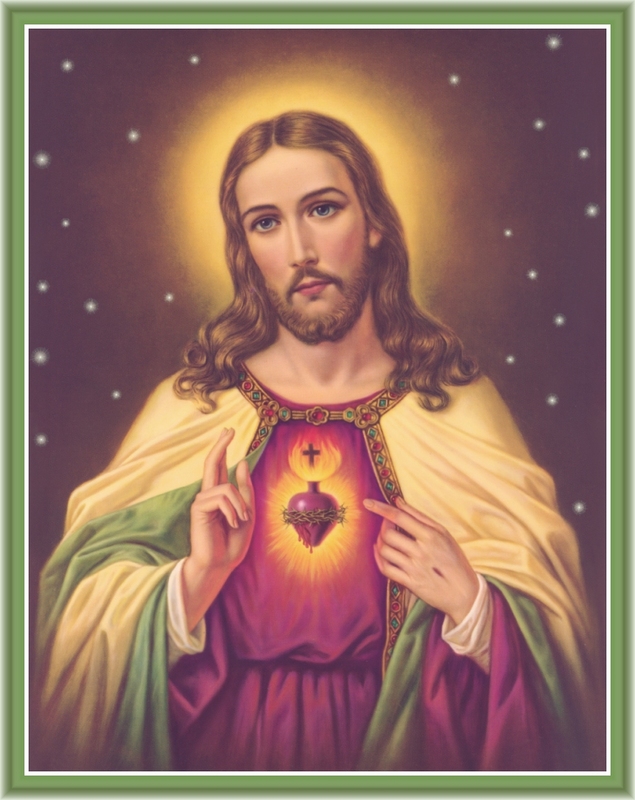 Although the perfection of the Sacred Heart of Jesus is beyond our reach, Jesus calls upon us to imitate His example: "I have given you an example, that as I have done to you, so you also should do" (Jn. 13:15). Not equality but similarity is possible. In particular Jesus calls our attention to two of His virtues: "Learn from Me, for I am meek and humble of heart; and you will find rest for your souls" (Mt. 11:29). Humility is the foundation of Christian perfection. The humble man is conscious of his nothingness and his need of God's mercy; therefore he submits to God's holy will and prays for and relies upon the grace of God. The prayer of the humble pierces the clouds and God will exalt him. Therefore St. Augustine lays down as a principle for the Christian who strives after perfection, first of all to lay the foundation of humility. Out of humility grows meekness. Meekness controls our temper, prevents the outbursts of anger and impatience, enables us to bear with the faults and failings of others, even to suffer their injustices without resentment or revenge. For the preservation of peace among men there is probably no other virtue of greater importance. Meekness fosters charity and charity is the fulfillment of the whole law. In an atmosphere of peace and charity all other virtues will flourish and bring forth the most beautiful fruits of holiness.